North Long Beach was balmy at best, with little breeze slightly felt on the sweltering brows of concerned Long Beach residents in the Jordan High School cafeteria this past Saturday. The citywide gathering was hosted by Tracy Colunga of Long Beach Development Services and is the third in a series of four neighborhood discussions in which city leaders and residents discuss issues and solutions that will then be incorporated into the Long Beach Violence Prevention Plan. With increases in property crime, fears of more crime due to realignment and scores of teens now on summer break, the meeting came at an opportune time. And in addition to being a meeting for the LBVPP, Saturday’s gathering was also the kick-off for a joint effort called Be S.A.F.E. (Summer Activities in a Friendly Environment) Long Beach, a week centered on programs for the youth and community awareness in the 8th and 9th districts. Tracy Colunga, the Neighborhood Coordinator for the City’s Department of Development Services, gave an in-depth presentation detailing the inner gears of Long Beach Violence Prevention Plan. The LBVPP’s main focus is preventing violent crime in the home, community and schools as well as providing resources for the victimized. Colunga, who is also a professor at her alma mater UCLA, gave the floor over to four groups of master’s students from UCLA’s school of social work. The UCLA students provided a three-pronged presentation on their study, “90805 Violence Prevention,” for which they spent significant time in North Long Beach, talking with residents, city officials and organizations. Be S.A.F.E. 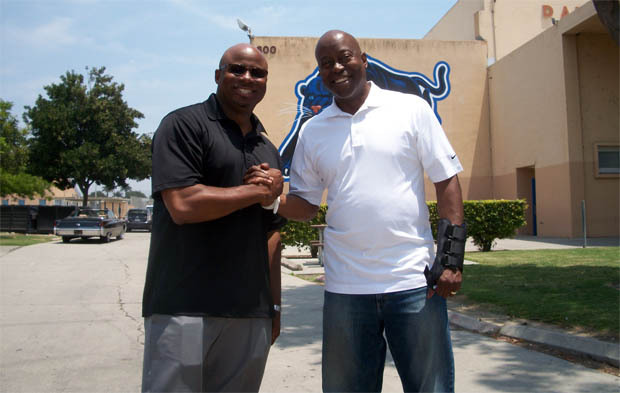 Long Beach is a joint effort of councilmembers Al Austin (left) and Steve Neal. Photo by Charles Snyder. The students’ presentations focus was on bullying in the schools, spousal abuse and human trafficking. Several of these issues have become a hot bed in recent years—especially human trafficking and prostitution in North Long Beach. According to the students’ stats, 48% of all human trafficking happening throughout South Los Angeles County is found in Long Beach. In addition, Los Angeles County has only 21 agency options servicing those who have been victimized by human trafficking; Long Beach has four, none of which are on the northside. 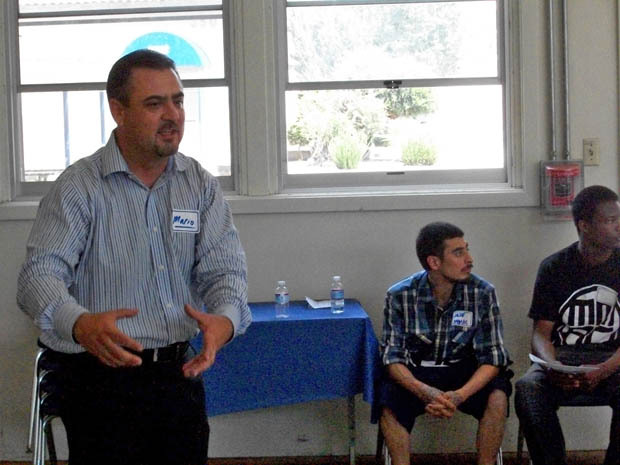 Colunga also brought in two out-of-town consultants–whose towns have a similar population and diversity as Long Beach–for discussion and group break-out sessions which proved to be effective for participants. Subjects talked about in these break-out sessions included gang violence, bullying, police brutality, domestic violence, abuse, even structural racism. Mario Marcial, a community-building and conflict-resolution consultant from San Jose, commented on Long Beach’s political and grassroots cohesion. “Many times partnerships evaporate in city hall hallways,” he said, noting that Long Beach can be a shining example of community organization through the ownership of Long Beach’s neighborhoods from City Hall to the corner. It’s going to take a critical mass movement from Long Beach residents and city officials meeting each other half way to effectively induce change and to break down perceptions, especially in communities like North Long Beach. And programs like the Long Beach Violence Prevention Plan and Be S.A.F.E. Long Beach attempt to do just that. Brighter Future Peace Jam | Friday, June 7, 5PM | Houghton Park, 6301 Myrtle Ave.
Citywide Gun Buy Back | Saturday, June 8, 10AM | LBPD Sub-station, 4891 N. Atlantic Blvd. 2nd Sundays: In the Village | Sunday, June 9, 1PM to 4PM | Long Beach Blvd. at Market St.